Hugo Lloris' red card proved costly as Luuk de Jong's late equaliser denied Tottenham in a 2-2 Champions League draw at PSV Eindhoven. 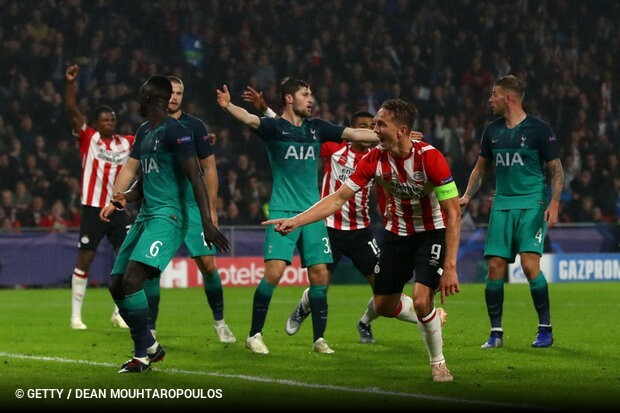 Hirving Lozano's deflected effort gave PSV the lead after 30 minutes of the Group B clash but Lucas Moura equalised before halftime, and when Harry Kane headed Tottenham in front after 54 minutes the visitors looked in complete control. The late drama means Spurs, who had lost their opening two matches to Inter Milan and Barcelona, remain third in Group B, with qualification for the knockout stages hanging by a thread with just one point on the board.